Graduated from ENSCI-Les Ateliers, Amandine Chhor and Aïssa Logerot started to build their own careers by working five years for prestigious architecture and design agencies, and companies like Hermès. From 2OO9 to 2O12, they have been collaborating on contemporary design projects using sustainable craft techniques in developing countries like Cambodia, Morocco and Cameroun. 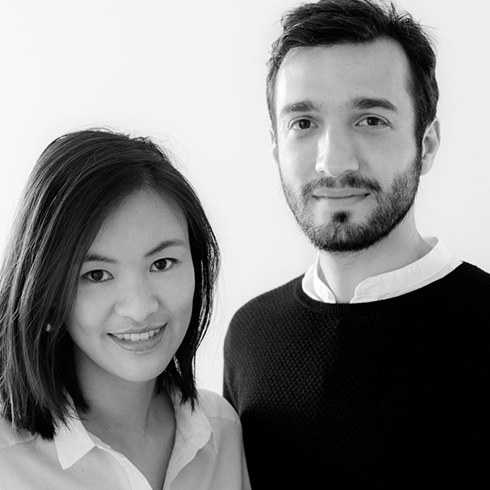 The duo founded their own design studio in 2O13 with the focus to create objects that have a story to tell and cultivate a perfect balance between function, form and techniques of production. Passionate for materials, crafts and industrial manufacturing processes, they draw products and furniture that valorize usefulness and the rigor of simplicity. Their precise, elegantand clean lines give their design its identity. Mixing various collaborations and travel experiences, the studio likes to work on different scales of project, from small product to scenography concept.